Nation’s first CNG Cadillac XTS limousines introduced by World CNG and MGM Resorts International. LAS VEGAS, April 6, 2015 /3BL Media/ – MGM Resorts International (NYSE: MGM) and World CNG, a nationally recognized leader in alternative fuel technology, have introduced the nation’s first compressed natural gas (CNG) Cadillac XTS limousines. The 22-foot-long luxury vehicles are the third generation of CNG-fueled limousines and vehicles in the MGM Resorts fleet. The Cadillac XTS limousines are 70 inches longer than traditional limos, giving them the designation of "stretch" limos. They are the first XTS limousines certified by Cadillac and the first-ever Cadillac XTS vehicles to be converted to CNG. The new limousines produce only one-ninth of the emissions when compared to their predecessors, the discontinued gasoline-powered Lincoln Town Car limousines. ARIA was the first resort in the company to introduce the luxury vehicle to its fleet. MGM Resorts currently has 31 CNG Cadillac XTS limousines servicing guests at ARIA, Bellagio Resort & Casino, MGM Grand Las Vegas and Mandalay Bay Resort & Casino. The new Cadillac XTS limousines have been specifically converted to enhance the guest experience and provide superior comfort while maintaining a responsibility to the environment. Each luxury vehicle includes custom leather interior. Additionally, each element – from door seals to state-of-the-art systems – has been hand-selected to create the ultimate guest experience. 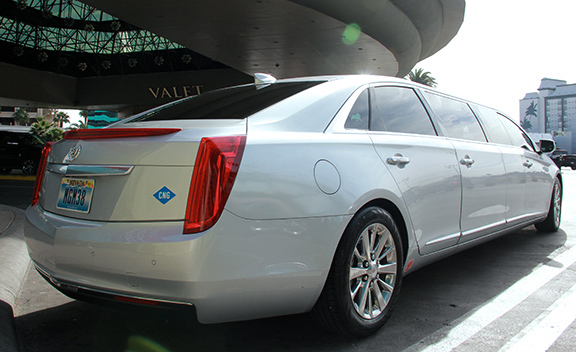 The new Cadillac XTS limousines will join a family of other CNG vehicles in MGM Resorts’ luxury transportation portfolio. CityCenter introduced the world’s first full fleet of CNG-powered limos when it opened in 2009 based on the Lincoln Town Car limousine. In 2013, World CNG, in partnership with MGM Resorts, introduced the nation’s first commercial fleet of CNG Cadillac Escalades. MGM Resorts International (NYSE: MGM) is one of the world's leading global hospitality companies, operating a portfolio of destination resort brands including Bellagio, MGM Grand, Mandalay Bay and The Mirage. The Company is in the process of developing MGM National Harbor in Maryland and MGM Springfield in Massachusetts. The Company also owns 51 percent of MGM China Holdings Limited, which owns the MGM Macau resort and casino and developing a gaming resort in Cotai, and 50 percent of CityCenter in Las Vegas, which features Aria resort and casino. For more information about MGM Resorts International, visit the Company's website at www.mgmresorts.com.